John Carpenter has shared an epic new track from his upcoming Halloween score. David Gordon Green's take on the iconic franchise hits theaters this week, and so does Carpenter's new score, which he collaborated on with his son Cody, and his godson Daniel Davies. We were treated to the "The Shape Returns" back in September, and the reworking of the classic Halloween theme left horror fanatics excited and wanting to receive more teases from the score. Thankfully, we have a new track and the wait is nearly over for the rest of the score. The new track from John Carpenter's Halloween score is entitled "Halloween Triumphant," and it takes the classic motif and builds to something that is fittingly triumphant, as the title implies. Pulsing bass and percussion start off the nearly 8-minute track, with the iconic melody coming in next. From there, more textures are brought in, including synth sounds that appear to be both modern and analog, before an electric guitar takes center stage, playing sparse elements of the melody. While triumphant, the song can also put you in a trance. John Carpenter recently revealed some of the secrets behind the new Halloween score. The composer/writer/director was relieved to be able to only have to focus on the music this time around and enjoyed trying to get into David Gordon Green's head. He also noted that he was "proud" to serve Green's vision. Carpenter clearly likes working with his son Cody and godson Daniel Davies, as they are credited as composers on the latest score as well. When it came time to sit down and rework one of the most classic horror themes in history, John Carpenter looked at technology from today as well as some of the original gadgets and synths that he used back in the day. He even revealed that the composing team recorded themselves rubbing their pants, and then running the sample through a distortion device to add eerie textures in a specific house slasher scene. Carpenter seems to be blown away with what he can accomplish with the technology these days, as he was in the late 70s when he discovered the analog synthesizer, which allowed him to compose as a one-man orchestra. John Carpenter's new Halloween score comes out this Friday, October 19th on Sacred Bones Records. The score will be on streaming services starting at 9PM Pacific time and 12AM everywhere else, with the physical release in stores on Friday. For those of us who are into the physical medium, Sacred Bones has already unfortunately sold out of the limited edition colored vinyl variants, which should come as no surprise. However, you can still purchase the black version, along with different bundles that include some pretty awesome t-shirts. 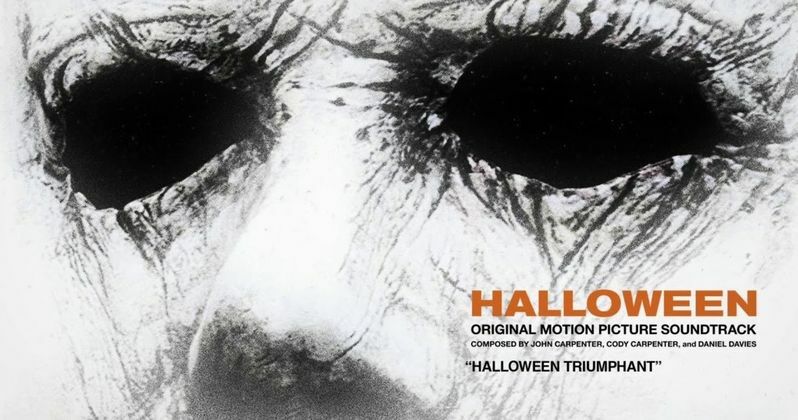 You can check out John Carpenter's epic "Halloween Triumphant" from the score below, thanks to the Sacred Bones Records YouTube channel.